Heaton used to boast many small shops, often on the corners of otherwise residential streets. Luckily quite a few survive and one of these is at 101 Addycombe Terrace. 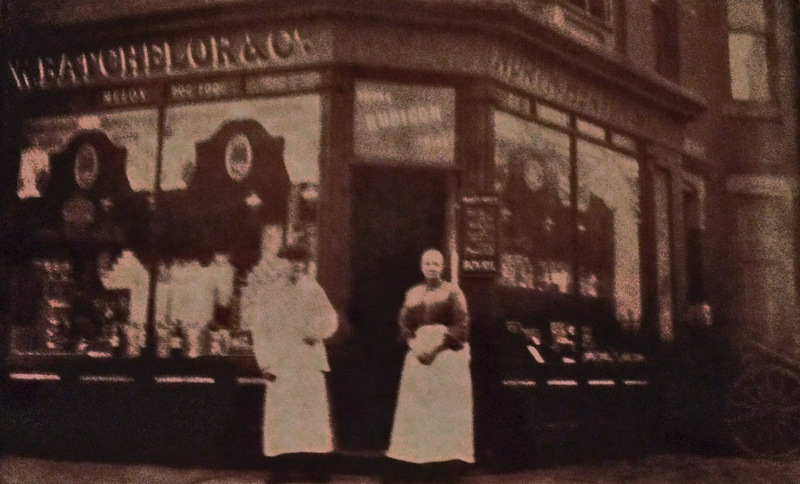 The photograph below shows William Batchelor and his wife, Margaret, who between them ran the shop for almost 40 years. The photo was passed to us by their great-grandson, Stephen. The original is fragile and this image isn’t very clear, but you can clearly read the name W Batchelor and Co on the left and just about make out North Heaton Stores on the right. Can you see the hand cart on the right hand side as well? And is that a person next to it? Notice the advert for Bovril next to the door. William Morpeth Batchelor was born in Kelloe in the south east of County Durham in 1863 and, as a boy, lived in West Cornforth near Spennymoor. His father, who was born in Worthing in Sussex, was a coal weighman. His job was to weigh coal as it came out of the mine and keep a tally of each miner’s work. William followed his father into the pits and through the ten-yearly censuses, we can track his career. Initially he was a labourer (1881). By 1891, he was married and living in Bill Quay, with his wife Margaret Kent Batchelor and his young daughter, Annie. His job was recorded as an under heap keeper. We believe this is a job at the surface of a mine under the direction of the heap keeper but we’d welcome more information. By 1901, he was a colliery weighman, as his father had been, and had a son, Edward. Ten years later, William was still living in Bill Quay with Margaret and still working as a colliery weighman. By now they had 4 children. Annie, now 21, and Emily, 16, were both domestic servants; Edward, 18, an architect’s clerk (Edward was the grandfather of Stephen who kindly copied the photographs for us. He became an architect and property developer but died in 1952 before Stephen was born); and there was now Elsie, aged 6, too. We don’t know why but the family was soon to leave County Durham where William and Margaret had lived the first 50 or so years of their lives. By 1914, the couple had become the proprietors of a grocery shop on Addycombe Terrace, where they remained for many years. Over time, the shop expanded into 103 and the living quarters into 105. The later picture below shows Elsie, who evidently helped in the shop. If you click on the photo to enlarge it, you’ll see lots of familiar brand names: Jacobs cream crackers, Bourneville cocoa, Lifebuoy soap, Players cigarettes, Ideal milk, Atora suet. And does anyone remember Melox dog food? William died in 1928. 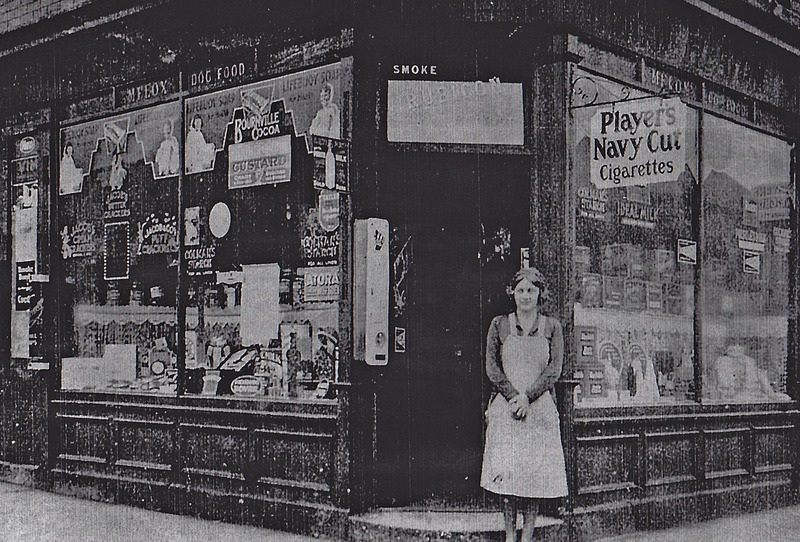 Margaret continued to run the shop until she too died in 1948. They are both buried in Heaton Cemetery. The shop retained the family name for a few more years still, before being taken over by a George E Fenwick. A Sewell had taken over by 1959 and, from about 1962, it became John Miller’s, first as a grocer and then an off licence. We are hoping some readers will have memories of the shop back then. J L Miller’s off licence was still there in 1988. But to backtrack, the Batchelors’ North Heaton Stores might have been the most enduring business at number 101 Addycombe but it wasn’t the first. And, although William and Margaret weren’t local, they didn’t come from as far afield as the first proprietor, Henry Richard James. This stretch of Addycombe Terrace was built at the end of the first decade of the twentieth century and the first owner of number 101 was Henry Richard Jones. We don’t know very much about Henry but what we do know is fascinating and we hope that some day we’ll unearth more about him. The 1911 census tells us that he was born in Billary, Madras in India in about 1872. He was already running the grocer’s shop by this time but he describes himself as a tea merchant and swimming instructor – an interesting and versatile man! Was he already a tea dealer in India? Or once he arrived in Heaton, did he simply employ his knowledge of the subcontinent in a trade where it would certainly have been useful? We don’t yet know. His name suggests that he was of British origin. The was a large British presence in the ‘Madras presidency’ in the late nineteenth century when Britain ruled India. India eventually achieved independence in 1947. We don’t know when Henry moved to Britain or whether he came straight to Newcastle. We can see from the records though that he was here by 1901, lodging at Mrs Mary Rodgerson’s boarding house at 50 Cardigan Terrace. (Mary, a widow, was assisted in the running of the boarding house by her 13 year old daughter and she had two younger children.) But by 1908, Henry was married to a local woman, Mary Irvine, living further down Cardigan Terrage at number 108 and running a grocery at 182 Heaton Road (what is now Sky Apple cafe and restaurant). The Addycombe Road shop came a couple of years later but by 1914, he had moved on: we don’t yet know where to. And now, over a hundred years after it first opened, 101 Addycombe terrace is still a grocery store, general dealer and off licence. Omer Hayat has run Omer’s Convenience Store for 21 years. Let’s hope the shop lasts another hundred years! This entry was posted in Research and tagged A Sewell, Addycombe Terrace, cafe, Cardigan Terrace, George E Fenwick, grocer, Heaton Road, Henry Richard Jones, John Miller, Margaret Kent Batchelor, Mary Irvine, Mary Rodgerson, miners, North Heaton Stores, off licence, Omer's, restaurant, Sky Apple, swimming, tea dealer, William Morpeth Batchelor on February 23, 2014 by oldheaton.